Home > Gridwalls > Double Sided Slim Bin Slatgridwall - 4ft. This 4 Foot Double Sided Slim Bin Slatgridwall is a great way to set up interior walls anywhere you want in your store. Measuring 24-inches wide by 48-inches tall, this display fixture is double-sided with legs so that you can give a 360-degree view plus it is compatible with grid wall bins and accessories. Fill this freestanding floor fixture with various types of bins and hooks and advertise novelty items, toys or other small impulse purchases. Offering a great view of your merchandise when displayed on this floor display. This grid display comes with color options and makes an outstanding candy display fixture. The chrome finish is slightly higher due to the fact the materials cost more. 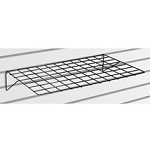 This slat grid floor display lets you increase space for merchandise viewing and does not take up much of your retail floor space. 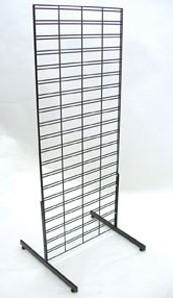 Order your metal grid display and the hanging accessories from us here today at Candy Concepts Inc.